Valhalla Confections was co-founded in California in 2014 and rapidly gained popularity as one of the most consistently dosed, best tasting, and fast acting gummies on the market. Valhalla Gummies are handcrafted by our talented staff in Nevada, California and New Mexico. Being one of the only strain specific gummies, it’s easy for users to maximize the desired effect and minimize the rest. With 3 flavor varieties, our great tasting, long lasting gummies are dosed precisely to have the same effect every time. Valhalla has NO sales staff. Instead, we rely on a great product and 100% word of mouth. In three states and counting, the formula is working. We’re gaining many happy new accounts every week and are typically the best selling edible (not just best selling gummy) with each. Our confections are artisan hand-made in small batches. 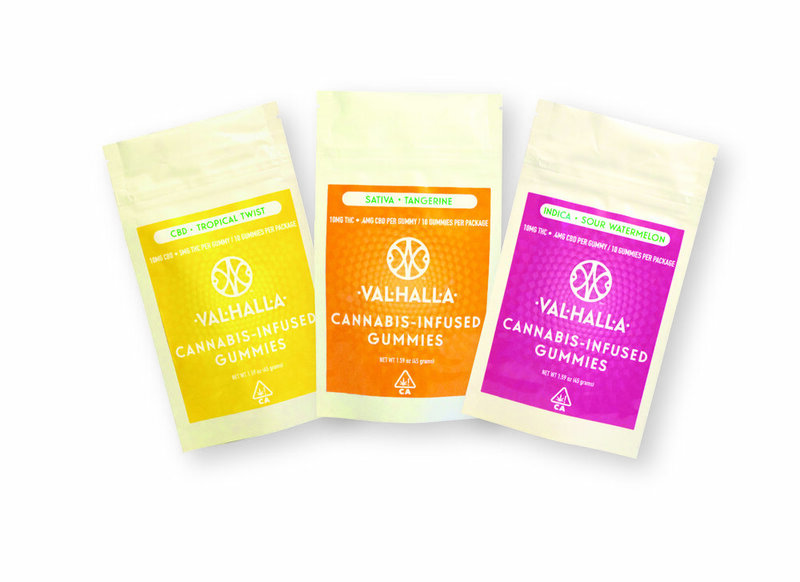 Valhalla gummies taste great and are a healthy alternative to inhaling cannabis smoke. Here are at Valhalla, we know overmedicated edibles can be intimidating, so we help ease you into the experience with 10mg micro-dosed pieces. Our medication is sourced from sustainably grown local organic farmers. This high quality cannabis is transmuted into gold--a clean, solvent-free terpene and cannabinoid rich amber oil. This oil carries many of the same properties as whole flower and helps facilitate the entourage effect, meaning you aren't just getting THC, but a whole pantheon of cannabinoids each with their own beneficial healing properties. Each gummy is precisely and consistently dosed so you can expect the same relief each time you heal tastefully. Valhalla is now fully licensed and in process of building out a new state of the art Kosher Certified headquarters in Northern California. We couldn't have done it without so many people spreading the Valhalla good word. Thank you for your amazing emails, love, and support.